A driver arrested on suspicion of causing three deaths on the Frank Perkins Parkway remains in a critical condition in hospital, police confirmed this morning (Monday, April 15). 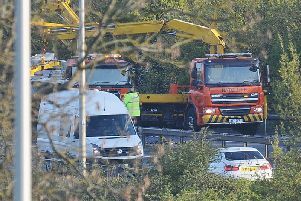 Three people died after the two vehicle crash shortly after midnight on Sunday by the slip road at Stanground. Police said this morning he remains in a critical but stable condition in hospital. The names of the victims are also not being released yet as formal ID has yet to take place. This is not expected before tomorrow.